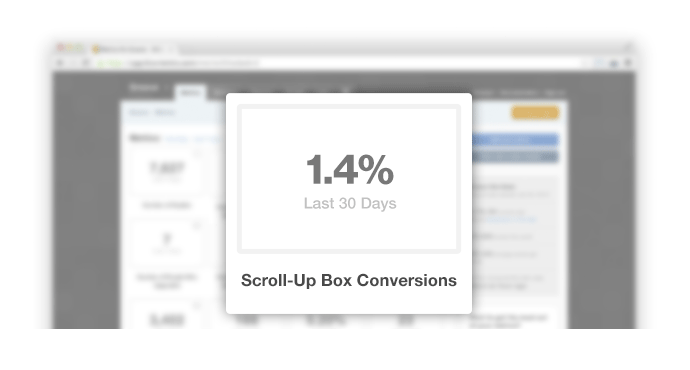 In the last half year, we’ve systematically grown our email list by more than double. Here’s how. A few weeks ago in an interview on this blog, Laura Roeder said something that echoed one of the most important lessons I’ve learned in my journey as an entrepreneur. 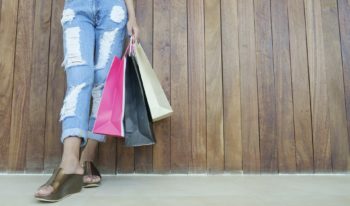 In the marketing world, there’s this axiom that people need seven touches before they buy. I have no idea if that’s true or not, but you see a lot of SaaS products where you can either sign up for a trial, or you can buy. That’s it. They don’t have any kind of email newsletter, or free content in exchange for giving an email address. 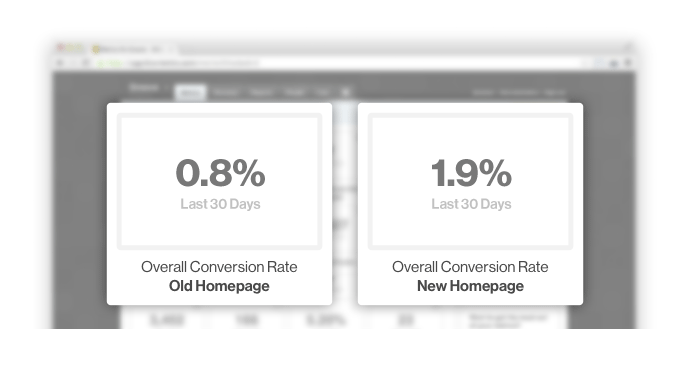 I would say most SaaS companies don’t do anything like that, which is pretty crazy, because most people are not ready to buy the first time they hit your homepage. If you’re not doing any kind of email collection, you’ve just lost them. It’s a hard lesson that we were lucky to learn early on, and building our email list has been a priority for us since day one. But a few months ago, we realized that we had lost our focus. We had been testing the waters on so many different strategies and tactics on the marketing front, that the growth of our email list was stagnating. Our blog is the single biggest source of our new trial signups, and blog subscribers are more than twice as likely to sign up for a trial as non-subscribers. Building an email list has had a very powerful, and very measurable, impact on our business. So we decided to bring our attention back to our list, and do whatever we could to grow it as effectively as possible. Today, I’m sharing what worked best. We’ve published and studied more than 150 posts now, and looking at the performance of our content over time, there’s one takeaway that jumps out more than any other. Some content pieces fail to generate much interest or traffic at all. Some content pieces do okay. Some content pieces are viral, and they get shared a lot, right away. Some content pieces burn more slowly, steadily picking up traffic via search results and links as time goes on. Every successful blog that I’ve studied along the way has all of these posts in their portfolio. It’s so, so easy to get discouraged when many of your early posts fail, or do just okay. And they most likely will. But over time and through a systematic approach, you learn what your audience wants to read about over time, and you begin to see more and more wins. And more and more traffic. Ultimately, traffic solves every problem, including getting more subscriptions. It’s a lot easier—and a lot more sustainable—to get 1,000 subscribers by getting 10,000 new visitors than it is to squeeze those subscribers out of your existing audience. So the most important thing to do is to keep producing content. Study how your content performs, and try new things to make it more successful. Talk to your customers to learn what they care about. Read other blogs that you like and try to understand what works for them. It’s taken us a long time to get to where we are, and we’ve got a long way to go. A lot of our content hasn’t done well. So when a piece of content doesn’t do well, don’t get discouraged. Because when it comes to solving any challenge, from not enough subscribers to not enough customers, you’ll never wish that you had less traffic. 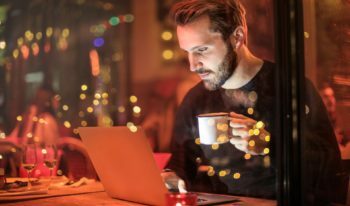 And if you regularly produce high-quality content and do the right things to get that content shared (start here), you’ll continue to build the traffic that’s so critical for any of the tips below to work. And with that out of the way, below are the 5 big wins we’ve had over the last several months that have helped us more than double our list to nearly 50,000 email subscribers. 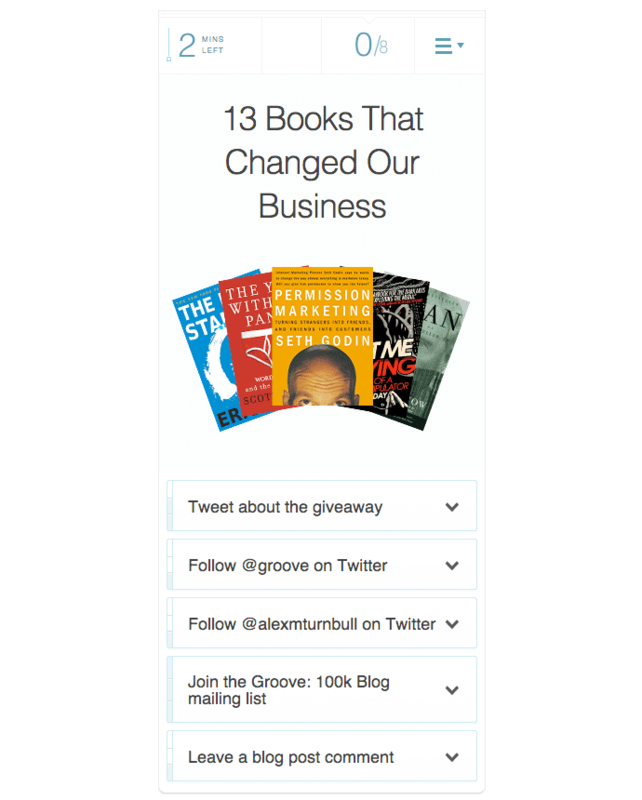 Another incentive-driven test we ran was our book giveaway in April. Using Rafflecopter, we gave away 39 of my favorite books (13 books each to three winners) in a giveaway on the blog that drew almost 1,500 new subscribers, at an amazing 9.8% conversion rate from the pool of visitors to the post while the contest was running. This is another tactic that we’re going to be doing a lot more with in the coming weeks and months. Takeaway: Giveaways might not bring you the most engaged subscribers (it’s your job to get them engaged after they sign up), but they deliver impressive numbers and build goodwill with your audience. You may have noticed that the tactics above deal almost entirely with implementation. We still have a lot testing and tweaking to do. 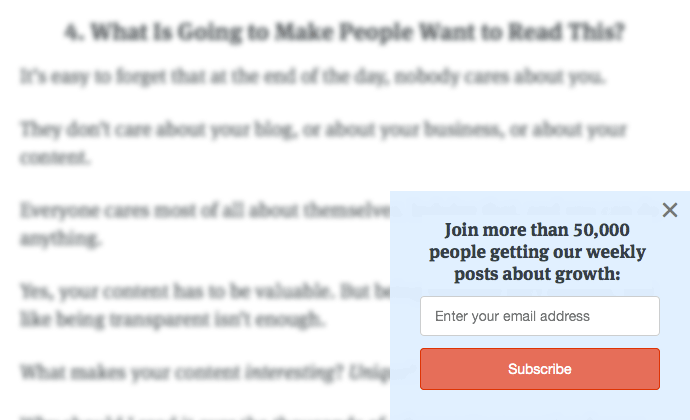 We’ve done very little with testing our calls to action, colors, headlines and other details. I think this is important to note, because a lot of people focus on the small details and how much work it might be to optimize every piece of this puzzle, and they never even start. 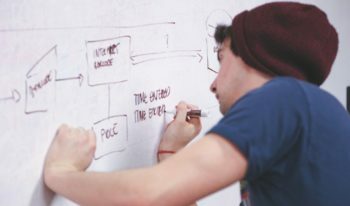 But as you can clearly see, simply starting with something – implementing a pop-up box or running a giveaway – is easy to do and can bring tremendous results without having to run a single test. And then, once you’ve built a foundation, you can begin to optimize. That’s where we are, and that’s what we’re going to focus on now. In the early days, we made two huge mistakes that we’ve had to work hard to correct (and to an extent, still haven’t corrected 100%, though we’re getting there). The first is that we did a poor job of segmenting our list. 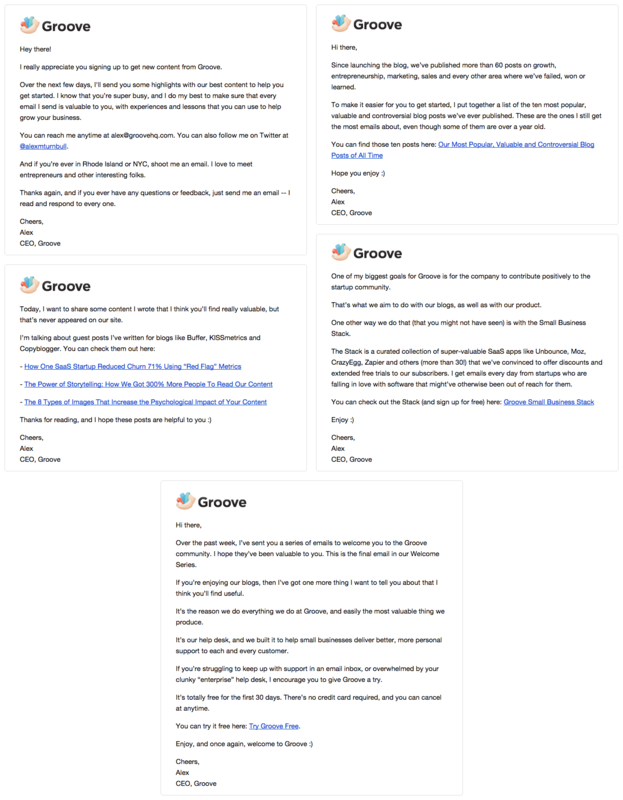 Everyone who signed up to get updates from Groove went into a single pool of subscribers. We didn’t know who was a customer, who was just a reader, who wanted content only from this blog versus the customer support blog, and so on. This didn’t just result in a messy list; it resulted in pissed off readers who were getting irrelevant emails from us. 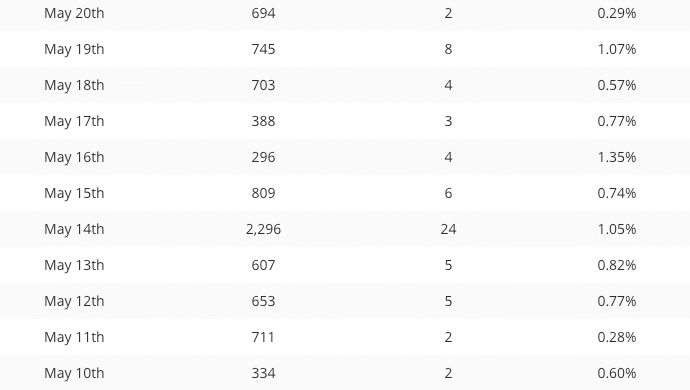 We’ve since spent a lot of time and resources segmenting our list properly and separating out customers from non-customers, and breaking the list up by where the subscriber came from. Now every new subscriber email gets checked to see whether they’re in our customer database or not, and we only send content relevant to the content the reader was consuming when they signed up. This has allowed us to create much more personalized experiences for subscribers, and we get a lot fewer angry unsubscribe emails now. 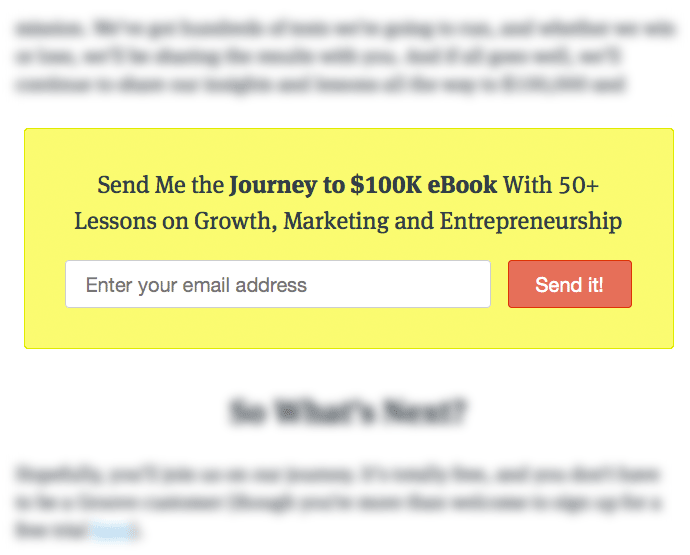 The second big mistake we made was not onboarding and nurturing our subscribers. 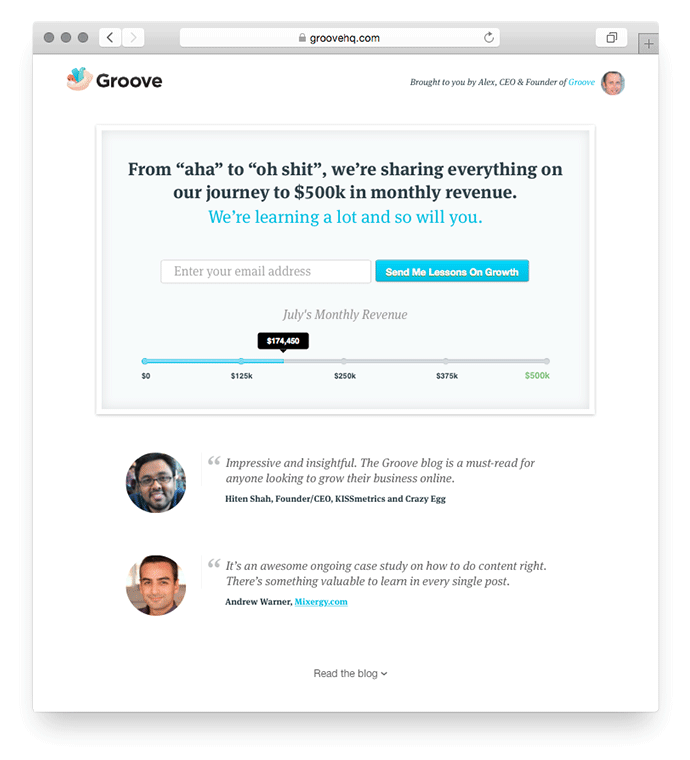 Once you signed up, you were on our list and simply thrown into the cycle of weekly emails that everyone else got. As we’ve since learned from talking to a lot of our subscribers, this was a huge missed opportunity to build a relationship with every reader with a series of “introductory” emails to help new subscribers know what to expect and get their hands on our best material from the start. Since implementing an onboarding email autoresponder for new blog subscribers, our 30-day subscriber retention has jumped by more than 25%! 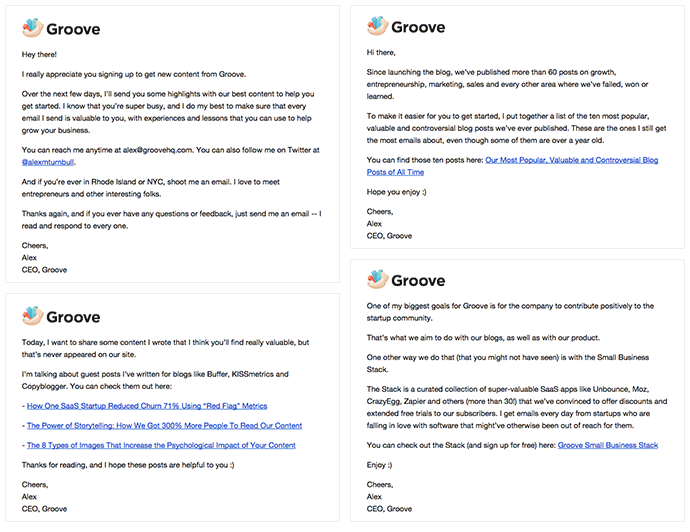 Obviously, the autoresponder serves a bigger purpose than simply as an introduction; it’s also where we begin to introduce Groove – the product – to our subscribers, and where that subscriber-to-customer conversion cycle begins. Email marketing is a topic with massive scope, and it can be confusing and overwhelming. I hope that when it comes to getting more subscribers, this post can serve as a great place to start. That one or two of the tactics that have worked for us will work for you, and give you a boost in your journey to building a strong list…and a successful business.